(CNN) -- An Al-Jazeera cameraman was killed in an apparent ambush near Benghazi, Libya, becoming the first journalist killed in the country since the start of the civil war, the network reported Saturday. Ali Hassan al Jaber was returning to Benghazi, an opposition stronghold in the east, from a nearby town where he had reported on an opposition protest when "unknown fighters opened fire on a car he and his colleagues were traveling in," Al-Jazeera reported on its English-language website. The cameraman and another person were wounded. Al Jaber was rushed to a hospital, but did not survive, the network said. "Al-Jazeera condemns the cowardly crime, which comes as part of the Libyan regime's malicious campaign targeting Al-Jazeera and its staff," the network reported. 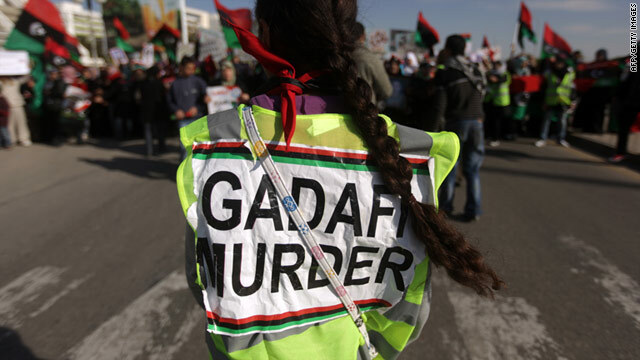 A civil war has broken out between forces loyal to Libyan leader Moammar Gadhafi and a tenacious opposition movement. Since the start of the revolt last month, the government has kept a close eye on journalists. Reporters in Tripoli have been given minders and, in some cases, prevented from covering protests. The Committee to Protect Journalists said Friday it has documented more than 40 attacks on the media in Libya since February. They include 25 detentions, four assaults, two attacks on news facilities, the jamming of transmissions, and the interruption of internet service, the New York-based advocacy group said. Several journalists have also reported the confiscation of their equipment, it added. Friday, CNN Senior International Correspondent Nic Robertson and his crew were detained in Tajura, Libya, east of Tripoli, by forces loyal to Gadhafi. They were released, though their cabdriver was not. "We are free to go anywhere, any time, talk to who we want, when we want. That's what Moammar Gadhafi's son told me, that's what Libya told the U.N. We already knew it was all lies -- look at any number of our colleagues arrested, detained, in some cases, beaten -- but today it came home to us personally," Robertson wrote. Wadah Khanfar, director-general of Al-Jazeera, said the network "will not remain silent" and vowed to hold those responsible for al Jaber's death to account, Al-Jazeera reported. Al Jaber, a Qatari national, was born in 1955 and studied cinematography in Cairo, the network said.